VAC AERO is a leading vacuum furnace manufacturer, vacuum heat treating and coatings service provider to Aerospace and high-tech industries worldwide. 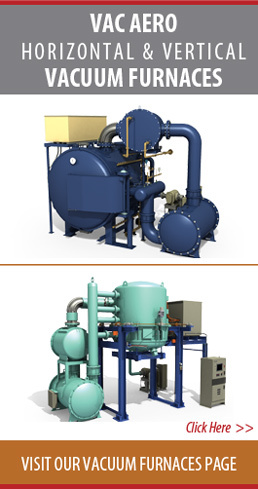 Advanced External Quench Vacuum Furnaces for Superior Processing! VAC AERO is committed to building furnaces with the lowest cost of ownership achieved through superior design, top quality materials and high performance operation. Constructed of the finest materials and craftsmanship, VAC AERO vacuum furnaces are operator friendly and designed for easy maintenance and minimal downtime to deliver outstanding quality and value to vacuum heat treaters. VAC AERO offers a complete line of heat treating and brazing furnaces, from small horizontal front-loading units to large, vertical bottom-loading models. VAC AERO’s advanced Honeywell HC-900 system “hybrid process control system” provides unparalleled performance and includes lifetime remote technical support. VAC AERO furnaces operate worldwide in diverse applications in a variety of industries such as; Aerospace, turbine engine component manufacture and repair, medical implants, nuclear materials, tool and die manufacturing, research and other high-tech industries. VAC AERO specializes in vacuum heat treating and brazing of advanced materials and holds numerous customer and quality system approvals from prime manufacturers in aerospace and other high-tech industries. 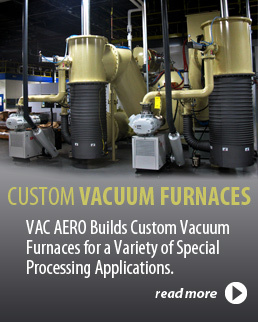 VAC AERO has the equipment and expertise to process a wide variety of materials including steels, superalloys, aluminum and titanium for such diverse applications as aircraft landing gear and structural parts, aero and land-based turbine engine components, nuclear components and a host of other specialized applications. Since its founding VAC AERO has gained the trust of its customers thanks to its peerless dedication to service and to the delivery of the highest quality end product. Extensive knowledge and experience, coupled with a unique approach to understanding client’s challenging processing needs and requirements has positioned VAC AERO as a leading metallurgical products and services provider worldwide. VAC AERO’s Oakville Metallurgical Services Division is accredited to NADCAP and AS9100C standards for heat treating, welding and tensile testing and holds numerous customer approvals from major aerospace prime contractors. VAC AERO operates heat treating facilities in Quebec and Ontario. VAC AERO offers a variety of coating processes for protection and restoration of both new and service-exposed components in it’s Boucherville, Quebec, Canada plant. Services to the aerospace and high-tech industries include; plasma and HVOF spray coatings as well as inorganic paint and pack coatings. VAC AERO operates a fully integrated state-of-the Art High Velocity Oxygen Fuel (HVOF) system based on a new generation Carbide Jet System and is equipped for applying a variety of protective coatings for gas turbine engine and airframe components, hot section thermal barrier coatings for combustion and after burner liners, and abradable seal coatings in high and low-compressor casings.